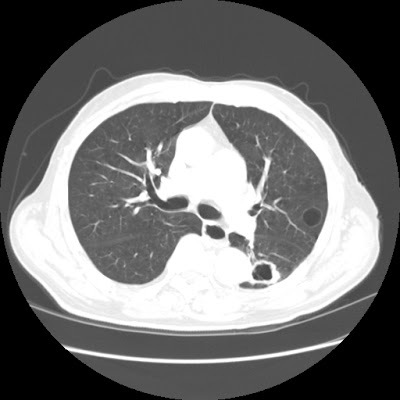 Discussion of interesting or befuddling cases related to pulmonary and critical care medicine. 15 y/o WF distance runner on track team c/o SOB. No improvement in the past year as perceived inability to breathe. She is is 5 7 tall, 115 pounds. All State, All American runner in 1600M and 800M. PFTs showed DLCO 71% pred (18.9 with ref 26.6), DL Adj 80% (18.9 with 23.5 ref). FVC 106%, FEV1 100%, FEF25-75 96%. Chest xray showed...ordered but not done yet. Any thoughts on etiology and suggestions for further work-up? 86 year old man with history of dementia brought by his caretaker for mental status changes and lethargy. He lives in an assisted living facility, but has no TB risk factors otherwise (He has his own apartment-like structure, but I beleive there is a common area). There was no hilar or mediastinal adenopathy. The thickest wall area on that lesion was 4-5 mm. Someone placed a PPD and it was 11 mm. It was reportedly negative 6 months ago. 1. How sensitive is gastric lavage for afb? 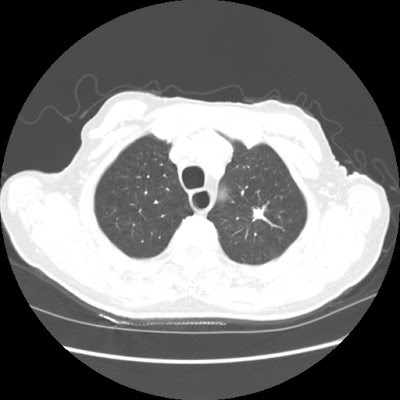 2. location of the cavitary mass is not where tb should be. I didn't get much feedback or interest on the post below on T-PA and empyemas so I contacted our T-PA rep and we got some references on the matter. In the Chest abstract I had listed in the original post the authors used 10 mg per instillation. In a brief review/case report in Hospital Pharmacy in 2003 (vol 38 (11); pp: 1024-29) the authors used 16mg/100ml NSS infused daily. They derived the dose by extrapolating the ratio of Streptokinase usually used in empyemas to the dose for MI's. In another Chest abstract, the initial dose was 10mg for complicated hemothoraces and that was increased to 25mg, still with good tolerability. The pediatric literature was a bit more consistent and usually 0.1mg/kg was used in various trials. There is a wealth of articles on using fibrinolytics in empyema (with mixed results) listing the doses for urokinase and streptokinase. I have had trouble finding a narrower consensus on T-PA dosing though. The Pediatric literature suggests ~4mg/kg and there is a dose of 2mg for clotted central venous access. I also found an abstract from Chest where doses of 10 mg were used but couldn't find a good consensus. Have you used T-PA in empyemas? And how much? Unfortunately, our computer is not letting me retrieve the PET images on this patient so I'll try and describe it without puppets. This is a 71 y/o man with long TOB Hx but still good mechanics (FEV1~78%) with a new lung mass. He was found to have a 2.5-cm mass in the RML and had a CT-guided Bx which was + for adenoCa. He then had a PET and came to see us: the mass was obviously hot but he had FDG-avid subcarinal and L hilar nodes and a 1-cm FDG-avid LUL peripheral lesion. I bronch'ed him and sampled his nodes and got lots of giant cells and lymphocytes but no malignancy (from both sites). A LUL BAL was non-Dx. Would you Bx the LUL separately? And if so how would you approach this (synchronous vs metastatic lesions, etc. )?